'Bakit Hindi Ka Crush Ng Crush Mo?' has already grossed P92.7-million after 12 days in theaters, to become the 3rd highest-grossing Pinoy film this 2013. Many foreign films have dominated the Philippine box-office week after week during the past 3 months. Too many actually: G.I. Joe: Retaliation, Iron Man 3, Fast & Furious 6, Man of Steel, World War Z, Despicable Me 2, Pacific Rim and The Wolverine. Thus, it's good to know that local films were able to perform great as well in the box-office despite heavy-weight competitions. took in P145M gross revenues. And now, another movie is joining the the club of certified box-office hits this 2013. Released last July 31, 'Bakit Hindi Ka Crush Ng Crush Mo? ', the first ever movie together of Kim Chiu and Xian Lim, has already earned P92.7-million in 12 days. According to Box Office Mojo's weekend report, the Star Cinema movie collected P34.5M on its 2nd weekend, and now with a 12-day total of P92.7M. A final earnings of over P100M is a sure bet already. In fact, Star Cinema already announced last Sunday that the movie has crossed P100M based on its own tally. The movie is truly exceeding expectations, a proof that the drawing power of KimXi loveteam is not only for television, where they starred together in hit soaps 'My Binondo Girl' and 'Ina Kapatid Anak'. Two more loveteams were launched in a movie earlier this year, but weren't as successful as Kim and Xian. 'A Moment In Time' featuring Coco Martin and Julia Montes posted a final P64.5M gross, while the KathNiel fim 'Must Be...Love' had P60.7M in its entire run. It's also grossing higher than Kim's movies with ex-boyfriend/loveteam partner Gerald Anderson. Kimerald solo movies were 'I've Fallen For You' (P35.9M final gross), 'Paano Na Kaya' (P82M) and 'Till My Heartaches End' (P60.5M). 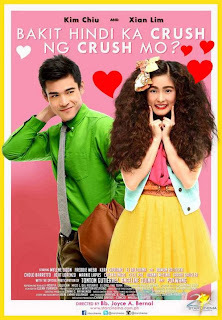 With this big success, Kim and Xian deserve to be given a follow-up movie by Star Cinema. What kind of movie do you like next for KimXi?